In a hurry? The important bits are underlined! In our experience budget family rooms can be pretty bleak but ours are distinctively different from the norm. Squint a bit and you could imagine you’re in a top end boutique hotel! 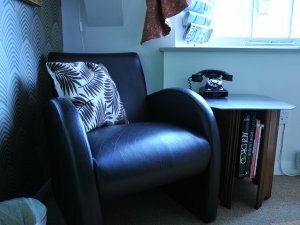 Our family rooms are not large but they all have interesting decor and extra little touches like a selection of books and short stories on the handy bedside shelf. There’s a light to read them by, hot water bottles and soft blankets stored under the bed too. Beds are made up for you with good quality linen and 2 pillow cases, one firmer than the other and there are blackout blinds for the windows that don’t let in any light – all important if the kids let you have a nice holiday lie in! The top quality solid wooden beds have memory foam mattresses that mould to your shape and assist with a good night’s sleep. 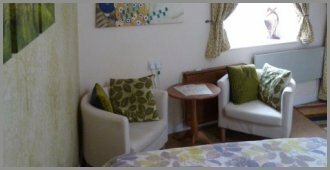 All family rooms are carpeted and have wash basins and en-suite showers. We’re one of the greenest places to stay in Wales too – our water is heated by solar energy with back-up electricity supplied by ‘Ecotricity’ that’s 100% sourced from renewable energy. 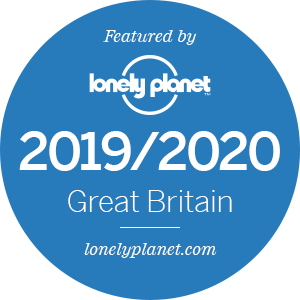 It’s nice to eat out (and we can tell you of some great family friendly places nearby) but it can soon gobble up the hard earned holiday budget! That’s where our self catering kitchen comes to the rescue. 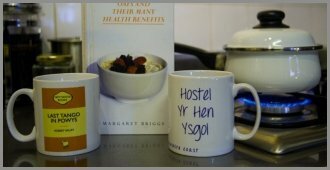 We’re a far cheaper option than a holiday let but you’ll find our kitchen just as well equipped. There are gas hobs, a double electric oven and microwave and ample pots and pans, utensils and cutlery. While the kids play table tennis in the adjoining community hall you can cook up everyone’s favourite and easily save yourselves £50 into the bargain! There won’t be much arguing about who does the washing up either. Based on a restaurant kitchen, with bright stainless steel work surfaces and shelves, we’ve designed everything to minimise the chores. There are better things to do – like retiring to the snug lounge for a nightcap. 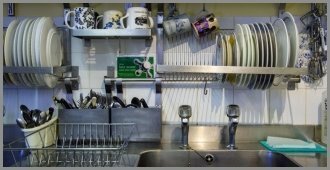 The plate racks and cutlery containers are designed for ‘drip drying’ – more hygienic and less work and with nothing hidden away in cupboards everything is easy to find. We pride ourselves on trying hard to keep the Old School spotlessly clean too. Check our guests reviews on Tripadvisor. We have been rewarded with the maximum of 5 of their famous green ‘blobs’ for cleanliness. Holiday lets in peak season are usually for a minimum of 7 nights but we’re a great choice for a short break in Pembrokeshire. For example, a 4 night break for a family of 4 in August would cost in the region of £256 including a complimentary breakfast. 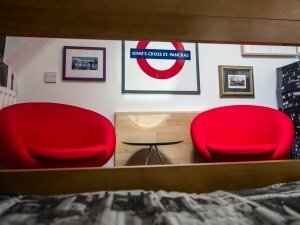 Our family rooms all differ from one another and offer great flexibility. One option is for the kids to have their own room – a single or double for you and a bunk room for the kids. This has proved a popular choice if you are holidaying with friends and their children. Room 1: Bunk bed with en-suite shower. Suitable for 1 adult and 1 child or 2 children. Room 2: 4’ wide bed with single bunk above and 2 further bunks. En-suite shower. Typically accommodates 2 adults and 3 children or up to 6 kids. 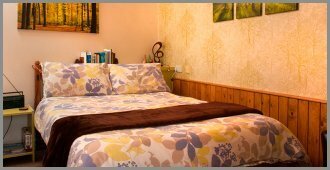 Room 3: Standard size 4’6” wide double bed with single bunk above. En-suite shower. Seating area. Suitable for 2 adults and 1 child. Room 4: 4’ wide bed with bunk above. En-suite shower. Suitable for 1 adult and 1 child or 2 children. Room 5: Standard size 4’6”wide double bed with single bunk above. En-suite shower. Seating area. Suitable for 2 adults and 1 child. Room 6: Standard size 4’6” wide double bed and bunk bed. En-suite shower. Seating area. Suitable for a couple with 2 children. 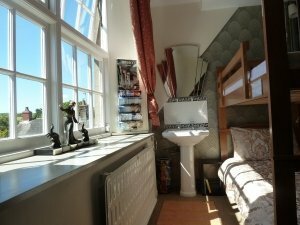 Note that we also have a fully en-suite self contained studio room for 2 that is separate from the main hostel building. If you’re thinking about somewhere to accommodate a 3 generations holiday or mini-break, it’s worth considering the options that this room offers. 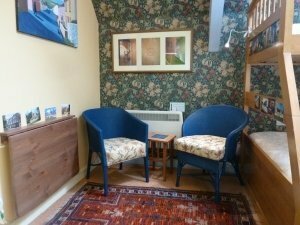 For example our studio room has been used by families as the ideal ‘bolt-hole’ for gran and grandpa! One of our most popular rooms, Room 1 is bright and sunny with a large south facing window with a view of Trefin’s quaint cottages and the countryside beyond. 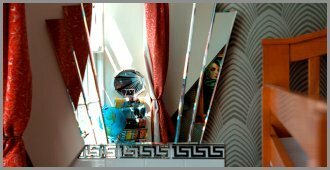 A budget room like no other, it is decorated in flambouant Art Deco style with furnishings and period touches that wouldn’t look out of place in a classy hotel! Perfect for Mum or Dad with one child, it has a top quality bunk bed with 3’ wide memory foam mattresses. The bed is solidly constructed from natural wood and there is good headroom for both lower and upper berths. The room features an en-suite solar and green energy powered shower. There is a 1930’s style wash basin with a matching mirror, a comfy leather arm chair and a further foldaway chair and table plus storage facilities for your belongings. See below for prices or click on the prices tab for full details. With a view over Trefin’s chimney pots to the rocky outcrop of Penberry in the distance (a fine destinations for a day’s walk along the coast path by the way), Room 2 is designed to have the feel of a beamed room at the top of an old house. 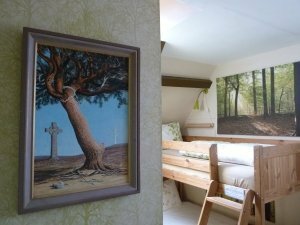 It is decorated with restful images of trees and forests with large photographic canvases by each bed. The room features an en-suite shower and wash basin. 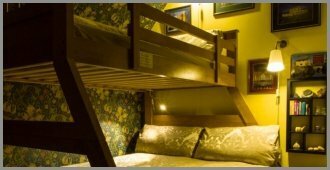 There are three bunk beds solidly constructed of wood and all have comfortable memory foam mattresses. One bed has a 4’ wide lower bed so technically this room could sleep a maximum of 7 people though this would be a squeeze. 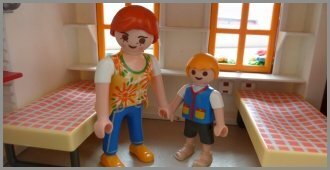 It is most popular as a room for Mum and Dad and 3 or 4 kids. 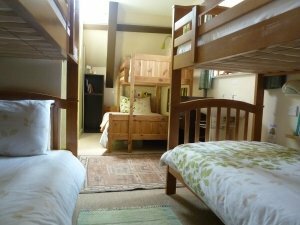 Also at short notice (if it’s not already booked) we can offer Room 2 as a family room for 2 adults and 2 kids at a reduced rate. 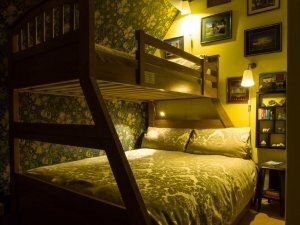 Another option, for example if you’re a group of friends, Mums and Dads could book doubles and use Room 2 as the children’s bunk room. See below or click on the Prices tab to view details of the rates for this room. Room 3 has a solidly constructed excellent quality bunk bed with a standard size 4’6” wide double bed making up the lower berth and a 3’ wide single above. The room has a wash basin, en-suite shower and a seating area with a flap down table to write or snack on. The loos are just along the corridor. Standard tariff: ADULTS: £22 per night CHILDREN UNDER 18: £10 per night. This is a cosy room with a bunk bed with a small 4’ wide bed making up the lower berth. There’s an en-suite solar and green electricity powered shower, wash basin, storage facilities and foldaway chair and flap down table. The beds feature comfy memory foam mattresses. Room 4 sleeps 1 adult and 1 child. See below for prices or click on the prices tab to see the full details of rates for this room. All our bedrooms have a theme and Room 5 is our homage to one of our favourite charities, The Landmark Trust. They restore special and often unique old buildings that have typically fallen into disrepair and then they go on to earn their keep as special and often unique holiday accommodation. The Trust furnishes them beautifully and we’ve tried to do this too in Room 5. From the lavish William Morris wallpaper to the many pictures of our favourite Landmarks there can be no other hostel bedroom quite like this anywhere in the land! 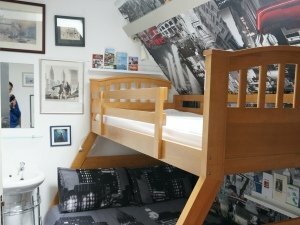 Kids will just love the top bunk but for parents who enjoy history, art and design or our wonderful architectural heritage, this is the room to choose. Room 5 features a standard 4’6” wide double bed with a bunk above and is thus suitable for a family with one child. The bed frame is of top quality wooden construction and the mattresses are made of comfortable memory foam that gently moulds to your shape and help promote a good night’s sleep. The room has an en-suite shower powered by renewable energy, a wash basin and a ‘snug’ with 2 easy chairs and a flap down table. See below for more about the room rates or click on the pricing tab for full details. A favourite of families with 2 kids, room 6 has a standard size 4’6” wide double bed and a bunk bed, an en-suite shower powered by solar energy and green electricity, a wash basin and a couple of comfy tub chairs. There’s a flap down table and reading lamp too, handy for early rising kids to play games at or do a spot of quiet colouring in while you have a lie in – some hope we hear you say! We’ve tried to get away from the stark feel of typical budget accommodation. 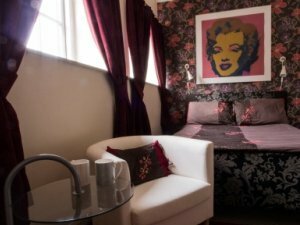 Room 6 with its vibrant decor and colourful large pop art prints adorning the walls has a hint of a swish hotel about it. Check below or click on the Prices tab for more details of our tariff. We advise that only older children should occupy rooms unaccompanied by adults. These options cannot be booked online. Please telephone us with your requirements. ALL RATES INCLUDE A SELF SERVICE BREAKFAST WHICH INCLUDES CEREALS, A QUALITY MUESLI, SELECTION OF PORRIDGES, BREAD FOR TOAST, BUTTER OR DAIRY FREE SPREAD, LOCAL MARMALADES, JAMS AND MARMITE, FAIR TRADE TEA AND ORGANIC FAIR TRADE COFFEE AND ORGANIC MILK. All ingredients as available. COOKED BREAKFASTS ARE SERVED IN THE VILLAGE CAFE 7 DAYS A WEEK. See our BED & BREAKFAST page for more details. The small print: We always try to accommodate guests in rooms of your choice if you have a preference but very occasionally need to make alterations so cannot guarantee this. If we do need to do this it will be to a room with similar or better facilities. Altering the booking to a different room rarely occurs with family room bookings. The most likely alteration would be for 1 adult/ 1child bookings changing between Rooms 1 and 4. 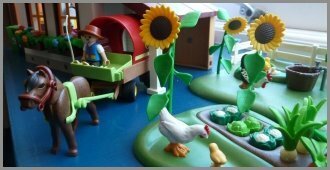 Owing to safety concerns such as stairs unprotected by gates, our minimum age for children occupying rooms in the main hostel premises is from 3 years old but for Mum and Dad and a wee one our self contained en-suite studio room may be just the ticket. 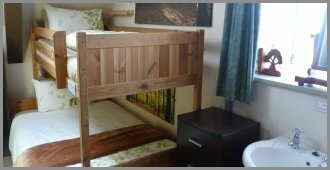 We can provide a top quality travel cot* and though there would be space limitations meaning that you may wish to fold away the cot when not in use, there is access* to the more spacious facilities in the hostel such as the lounge and kitchen. 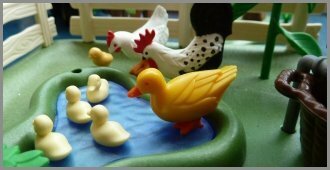 There you’ll find a high chair and lots of babies and tots toys in the toy box. 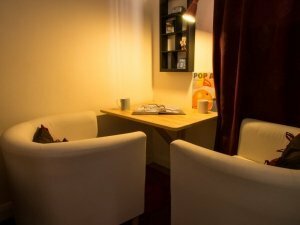 Click on the Studio room link below for more details about ‘Ty Popty’ and its facilities. *Please bring own bedding for the travel cot. 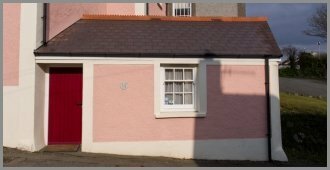 Please also note that if the main hostel premises has been booked by a group for their exclusive use, guests in Ty Popty, the self contained studio room, will not have access to the facilities therein. As group bookings are typically made well in advance we can usually inform intending guests of the situation regarding access.